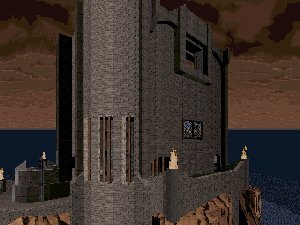 Dani J Swanson has created a new dukematch map which also brings Quake3Arena to Duke3d. This map has lots of inspiration from Q3A and perhaps from Bobdm1 also. Design is detailed and good as well as the sprite work. Anyway I think that the Tower is a little bit too big map for dukematch 'cause I like those small dm levels a lot more. Maybe author should make a smaller dm map or a single player map 'cause this map shows that the author has got the skills to do a good design.